How will this example digital plan help me and my business? 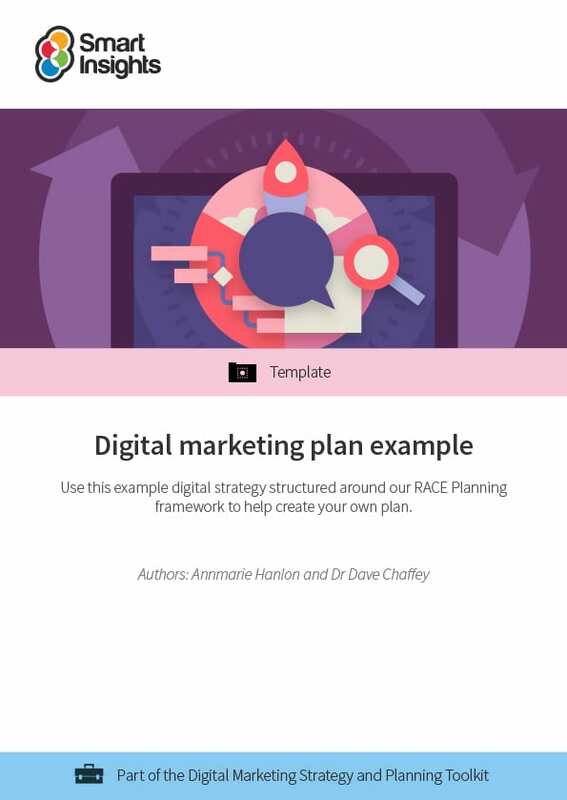 Smart Insights premium members using the planning templates in our Digital strategy toolkit asked us for examples of digital marketing plans to inspire them when creating their own plans based on the blank templates. So, we have created this example plan to help support the process when members create their own plans. The example plan is a fictitious B2C retail company - Wow Accessories - an online fashion accessories site for women for which representative objectives and KPIs are given. If you work in B2B marketing, see our B2B digital marketing plan example. Who is this example for? The example is to support anyone creating a digital marketing plan. It is a consumer marketing plan, so will be most useful for B2C marketers. However, the structure may be useful for B2B marketers too. Opportunity – Review current business contribution of digital channels through refining dashboards and set future objectives based on an in-depth marketplace review. Strategy – Define an overall digital channel strategy or specific strategy focused on customer acquisition (Reach), Conversion (Act and Convert) and customer retention and loyalty (long-term engagement). Action – Details of specific tactics to implement the strategy such as planning and integrating content marketing, SEO, Social media and email marketing into marketing campaigns. Related resources: Word digital marketing strategy workbook structured around the Smart Insights RACE planning framework and Marketing plan examples in PR Smith’s SOSTAC® format. Dave is co-CEO and co-founder of Smart Insights. He is editor of the 100 templates, e-books and courses in the digital marketing resource library created by our team of 25+ Digital Marketing experts. Our resources used by our premium members in more than 80 countries to Map, Plan and Manage their digital marketing.